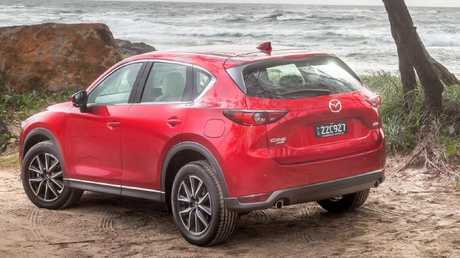 PRICE cuts are the standout items alongside the minor mechanical updates to Mazda's CX-5. Just 13 months after Mazda launched the second generation of its immensely popular mid-size SUV, minor tweaks to the petrol engines aim to reduce thirst marginally. Think 1kW on the base 2.0-litre and a 1Nm upgrade on the 2.5. Cylinder deactivation turns the engines into two-cylinder jobs when not under load. Of greater importance to buyers who might also be shopping a Nissan X-Trail or Toyota RAV4 are the price cuts, $400 off the Maxx Sport and Touring versions and $800 off the list price of the up-spec GT and Akera. 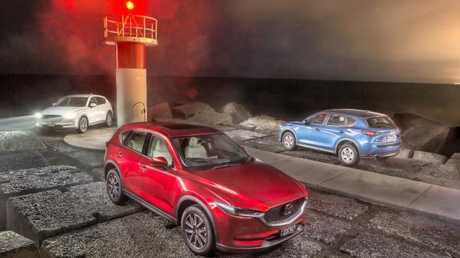 Diesel buyers have a genuine reason to revisit the CX-5, courtesy of a revised variable geometry turbo and more efficient combustion boosting the 2.2-litre's outputs by a credible 11kW/30Nm to 140kW/450Nm. It's thriftier, down from 6.0L/100km to 5.7L - and that's an update that piques your interest. CX-5 program manager Hideki Matsuoka cites the "well-to-wheel" approach of measuring CO2 emissions during the vehicle's production - while he's busy devising better thermal barriers for the pistons, someone else is looking at how to reduce burning crude oil when transporting Mazdas by ship. It's a noble intent - yet it hardly justifies a model upgrade when many companies would have let the mechanical tweaks slide as running changes in the production process. In terms of tactile tweaks, the Touring now has a windscreen-projected head-up display in place of the plastic panel set-up and the Akera picks up a surround-view monitor. The suspension carries over and the ride, as before, is marginally too firm to be called supple yet it's not jarring enough to be offensive. 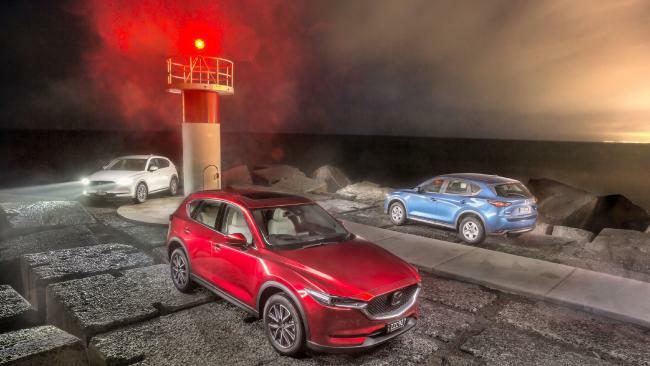 For people who appreciate driving - and who will tolerate the occasional mid-corner crash as the price of better front-end grip - the CX-5 is one of the most capable mid-size SUVs in the game. 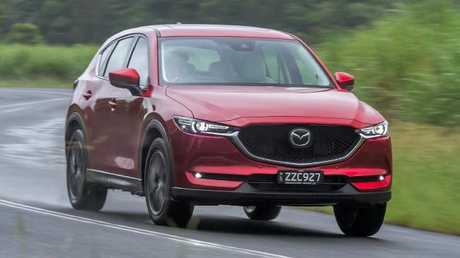 The steering is light but responsive once it rolls off centre and the chassis balance keeps the CX-5 sure-footed on country tarmac and gravel roads alike. The six-speed auto, the default transmission on all but the base version, is barely discernible as it shifts through the cogs. The 2.5-litre could do with a turbocharger to match motive performance with the dynamics. It's smooth if a touch noisy at high revs (and it will happily spool up) but lacks the uphill pick-up of turbo rivals. The diesel is the pick for those wanting to go quick or to quieten things down. The extra urge is evident from start-up and the drive thereafter can be both relaxing and rewarding. Real world fuel use of 7.1L/100km is close enough to the claimed 5.7L/100km to preclude complaint. The only caveat is ensure you drive on the freeway once a month or so to get the exhaust hot enough to burn off the deposits in the diesel particulate filter. PRICE List price is unchanged at $28,690 for the entry level Maxx. Prices are down by $400 on Maxx Sport and Touring versions, at $33,990 and $38,590 respectively. The GT starts at $43,590 before on-roads and the range tops out with a diesel-driven Akera at $49,190. TECH Touring versions now have proper windscreen-projected head-up display and the Akera adds a 360-degree camera to its safety features. PERFORMANCE No discernible changes from the petrol engines - which is a good thing, given the 2.5-litre now has cylinder deactivation. The diesel is a corker: smooth, torque-laden motivation with very little fuel use. DRIVING The CX-5 is lauded for its roadholding and that hasn't changed. High levels of grip transition into mild and easily corrected slips at the limit. The assistance software is calibrated to be unobtrusive and the steering is direct, if a touch light. DESIGN There's literally nothing to see here. There are no exterior or interior updates simply because the CX-5 still looks the goods. The CX-5 is still one of the segment's classiest cars. The pick: the diesel Touring at $41,990, with head-up display and improved donk.